Neck band applicators, or neck banders are designed to apply a heat-shrinkable film band around the neck of a bottle or container. Neck band applicators take a roll of tube film and fold the tube of film counter to its seams to open the tube film. The tube of film is then lower around the neck of the container by the neck band applicator. Neck bands can be either cut by the neck band applicator or can be supplied pre-perforated and simply pulled from the film stock by the neck band applicator. After the film band is placed on the neck of the container, the container passes through a neck band shrink tunnel that shrinks the film of the neck band around the neck and cap of the bottle. Neck bands are designed to be tamper evident so that the film of the neck band must be ruptured if the cap is removed from the container. Neck band applicators have special tooling often referred to as a “bullet” that is designed to open the flat film tube. This “bullet” is placed within the film tube, is held in place by tooling surrounding the film tube, and is specifically sized for the size of neck band. The “bullet” is a change part for neck band applicators. The operation of a neck band applicator is similar to the operation of a body sleeve applicator, though neck band applicators often have machine limitations that prevent them from applying full body sleeves. Accutek Model 42-TEB-001, automatic, stainless steel, tamper evident neck bander with shrink tunnel rated from 20 to105 containers per minute – depending on materials, application and machine configuration. Layflat: 16mm to 150mm. Cut Length: 16mm to 200mm. Container size range: 3/8" to 5" in Diameter. Equipped with registration, vertical perf, servo drive, bottle spacing assembly with variable speed controls, touch screen interface, and interlocking Lexan safety guarding. Shrink Tunnel dimensions: 24" in Length; aperature 4" in Width; 4" in Height. Mounted base frames with height adjustable legs. PDC Model 45ER, automatic, neck bander / sleever rated from 20 to 80 product per minute – depending on materials and application. Band / sleeve size range: 3/8" to 3" in Diameter; 3/4" to 5" in Height with 4.8" maximum lay flat and minimum depending on application. Equipped with 120" long x 3.5" wide stainless steel lugged product conveyor with 3" centers, variable speed controls, photo eye registration, 24" long x 3" wide stainless steel heat tunnel with controls. Mounted on height adjustable legs. Axon, Model EZ-130, automatic, tamper evident shrink neck bander or sleeve label applicator. Rated from 30 to 150 containers per minute – depending on materials, application and machine configuration. Layflat: 15 mm to 130 mm. Film thickness: 40 to 70 microns (1.5 to 3 mil). Equipped with photo eyes for machine activation, registration eye, low roll sensor, knife film cut off and stepper drive film feed system. Touch pad controller with LED display. Film specifications: up to 15" diameter roll. Mounted on a height adjustable stainless steel frame. Axon Model EZ-300, automatic, tamper evident shrink neck bander or sleeve label applicator. Layflat: 100 mm to 300 mm. Sleeve height: 25mm to 250mm. Maximum container Diameter: 7.38". Film thickness: 50 to 100 microns. Equipped with vertical perforation, knife film cut off, touch pad controller has LED display and E-stop. Film specifications: 15" in diameter on 3" OD core. Mounted on 48" x 40" stainless steel base frame with casters. Speed dependant on materials, application and machine configuration. PDC Model 75M, automatic, tamper evident, neck bander / sleever rated from 50 to 300 containers per minute – depending on materials and application. Bands: 3/8" to 3" in diameter by 3/4" to 2" in height. Equipped with worm screw in-feed, knife film cut-off, barrier guarding, auditory alarm and E-stop. Axon EZ-100, automatic, tamper evident shrink neck bander or sleeve label applicator rated from 30 to 150 containers per minute – depending on materials, application and machine configuration. Layflat: 18 mm to 130 mm. Container Diameter Size Range: 10m to 79mm. Film thickness: 40 to 70 microns (1.5 to 3 mil). Equipped with photo eyes for machine activation, knife film cut off, stepper drive film feed system and a touch pad controller with LED display. Mounted on a height adjustable stainless steel frame with casters. Film specifications: up to 15" diameter roll. 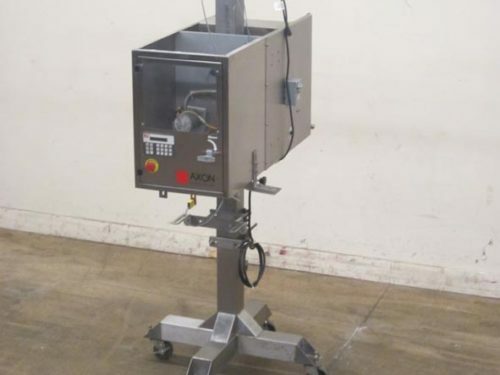 Axon Model EZ-300, automatic, tamper evident shrink neck bander or sleeve label applicator rated from 10 to 60 sleeves or 10 to 70 neck bands per minute – depending on materials and application. Layflat: 100 mm to 300 mm. Maximum container Diameter: 7.38". Film thickness: 50 to 70 microns. Equipped with vertical perforation, knife film cut off, touch pad controller with LED display on/off switch with e-stop, statis light bar and mounted on 46" x 40" stainless steel base frame. Film specifications: 15" in diameter on 3" OD core. Axon EZ-100, automatic, tamper evident shrink neck bander or sleeve label applicator rated from 25 to 120 container per minute – depending on materials and application. Layflat: 15mm to 112mm. Container Size Range: 3/8" to 2-11/16". Film thickness: 40 to 70 microns. Equipped with photo eyes for machine activation, knife film cut off, stepper drive film feed system, touch pad controller with LED display. Mounted on height adjustable stainless steel base frame with casters. Film specifications: up to 15" diameter roll on a 3" core. PDC, Model F-200, automatic neck bander. Rated from 10 to 100 containers per minute – depending on materials, application and machine configuration. Band size range: 2½" to 6¾" in diameter and 1" to 2.3" in height. Layflat: 63mm to 242mm. Equipped with 24" product in feed worm screw, 22" diameter star wheel container indexing, powered unwind station horizontal perforation blade, vertical perforation wheel, static elimination, pull down applicator, (2) Leister pre-shrink heaters and interlocking safety guarding. Control panel with an AB controller, Pro-Face touch screen display, run / jog switch and E-stop.